King Osric called all the prominent members of the four great factions and the Throne's Counsel to his annual autumn feast. His son, Prince Rangar, had gone in search of the Sword of Hope and had been missing many years. This annual feast was part of a traditional celebration and hope for his return. At the feast, the King and Queen were poisoned by unknown assassins. While the factions have never seen eye to eye, this attempt caused blame and distrust that erupted into violence. The members of the Throne's Counsel (the High Priestess, the Sorceress, the Physician, and the Apothecary) tried to save the King the best they could, but some could not bring themselves to accept "dark magic" or "mad science". It was discovered that a Shadow Elf with a small group of Orcs had been responsible for the assassination attempt. These kind of creatures had not been seen in Olaran in ages. But by then it was too late. The King and Queen succumbed to their death and left and empty vacuum of power upon the thrown. The Kingsmen leader, Reeve Amurin, was cousin to the Queen and protector of the Throne. And Duke Killian, leader of the Hearth-guard, was cousin to the King and saw the throne as his birthright. The Rangers saw this as a chance to grab power and reform the Kingdom and its laws. And the Sea Lords only owe allegiance to the King of Olaran, which left them open to grab whatever power they could get their hands on. Luckily, the young prince was found quickly. He was injured with patchy memory, but crowned King and struck an uneasy peace between the factions again. Nearly a year after King Rangar was crowned, he sent a large group of forces to retake his abandoned quest to reclaim the Sword of Hope. Rumors had been spreading that barbarian tribes and dark forces were on the hunt for its opposite, the Etcher of Souls. Though it was far outside of the orthodox, the decision was made to send large groups from each faction to assist in the expedition. The Sea Lords would ferry troops and maintain trade routes. The Rangers would scout ahead and help map new territories. The Hearth-guard would organize military action if needed. 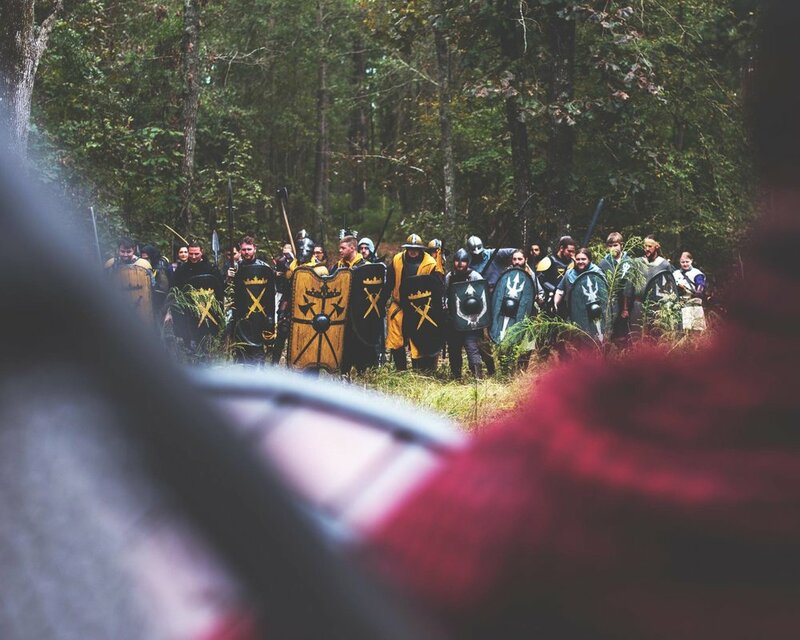 And the Kingsmen would create and maintain order in any new settlements that were found or created. Many ships and soldiers were lost in the voyage due to a terrible storm. However, an unexpected surprise came in the form of the King! King Rangar left the kingdom in the hands of the High Priest of Luminos and decided to personally oversee the expedition. While this didn't set well with anyone, some rose to challenge the King on the decision, namely Duke Killian of the Hearth-guard and Captain Arquus of the Rangers. Struggle broke out after the King denied them the right to return to Olaran and threatened execution for treason. The Hearth-Guard began ransacking Sea Lord supply wagons and trying to make their way home. Soon the campaign made a turn towards infighting. As the fighting went on, it became clear that the King was not of sound mind. Eventually he was declared mad and a possible danger to himself. The fighting only stopped when it was realized that the High Priest and the Sorceress had conspired to hex him and send him away. Additionally, the Reeve is also missing from the Throne's Counsel after an apparent assassination attempt. The expedition laid down arms long enough to discuss how to best help the King. But no more was the King sent to a remote monastery to await a cure than did Duke Killian declare his "right" to be Regent of Olaran. The Kingsmen and Sea Lords refused to acknowledge his claim until the Throne's Counsel was dealt with and there could be a proper appointment. The Duke went on to try to steal Commodore Torvin's ships and make his way back to the realm with a host of Rangers and Hearth-guard behind him. They were met close to shore by the Kingsmen and Sea Lords, and stopped before the Duke could escape. Rather than executing Killian, he was banished to walk back with all that supported him while the rest would sail to Olaran and prepare for his return. This event picks up in the days following the defeat of Duke Killian’s supporters still on the distant shores of Ithacus. Some forces are remaining for the quest at hand while others are still trying to find a way back to Olaran. Before anyone gets too far, a few more surprises lie in wait on these distant shores.